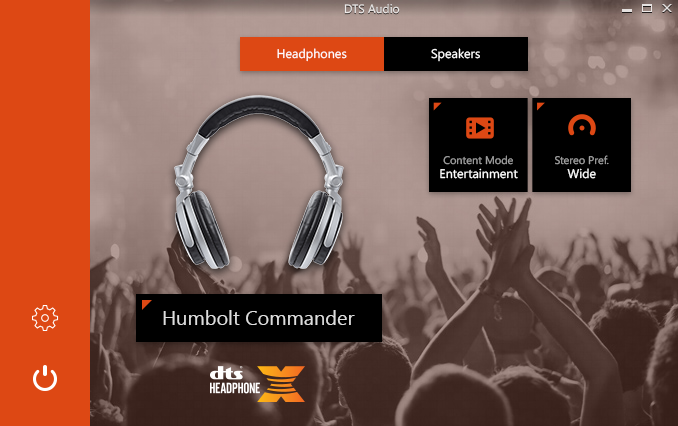 DTS licenses multiple audio enhancement technologies to Windows PC manufacturers so that consumers can enjoy high quality immersive audio experiences over headphones and with the built-in speakers. 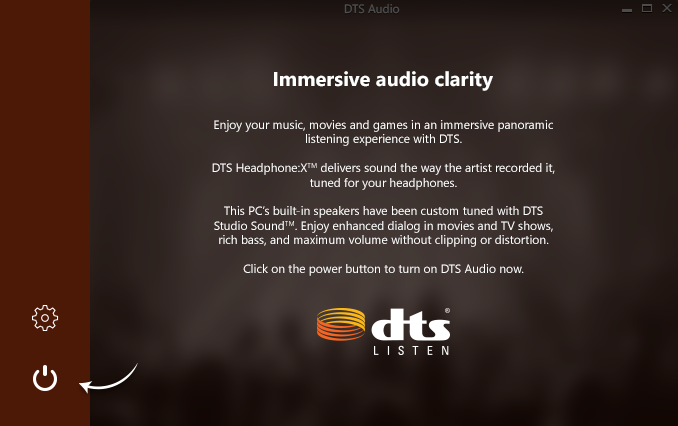 To help simplify the technology integration effort, as well as hopefully inspiring our PC partners, DTS creates "reference" applications for changing advanced DTS audio settings which PC manufacturers are free to integrate as-is, modify, or ignore completely and do their own thing. Posted here are screen mockups we gave to the engineering team as part of the UX deliverables. I'm glad to say that the engineering team did a great job implementing the UI, as well. A few PC manufacturers integrated this app into their products mostly as-is, and we received a lot of great feedback from our partners on the overall design. As one can see, compared to the legacy app DTS had been delivering, it was a huge advance in design, brand support, and user experience. My Role: Lead UX designer. Deliverables included concept designs, wireframes and UX requirements documentation. The graphic designer executed the high resolution screen mockups shared here. 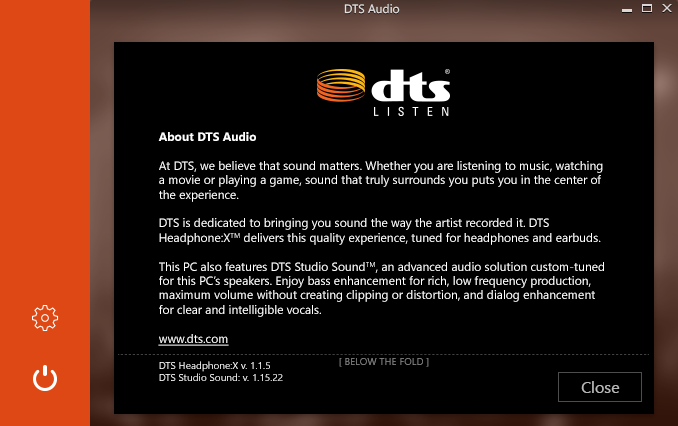 Here are 2 screenshots from the legacy DTS Studio Sound app. This app had been in the market for a number of years and was in need of replacement. The app offers an immersive visual experience, with the high resolution image changing depending on the user-selected Content Mode. The Content Mode creates an optimized listening experience for different kinds of multi-channel content. With this design approach, I wanted to craft a more emotionally engaging experience that felt more relatable and human to the user rather than abstract and technical. In addition, I wanted to present a friendly and familiar Windows Metro-style UX that would also be finger-friendly for touch-screen PCs. This content mode is optimized for video games. We went for a more retro gaming design so that it was relatable across cultures, wouldn't alienate PC manufacturers facing competition from game consoles, and didn't favor a specific video game. It's a tough balancing act. 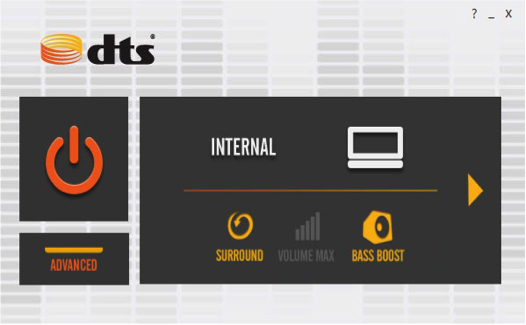 If audio were currently being routed through the built-in speakers, the user would have a few more audio enhancement options, such as boosting the bass or engaging volume leveling. A graphic equalizer was also available for the built-in speakers. 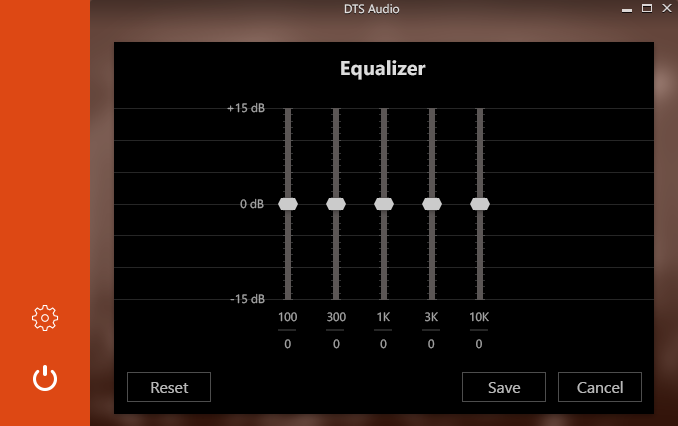 This app featured a basic 5-band graphic equalizer with no presets. As more of a reference app that the PC manufacturer was free to customize or ignore, it was determined that it would be better to leave the definition of EQ presets to the manufacturers. The dialog featured Save and Cancel buttons so that the user would be free to experiment and "e;audition"e; any updates before applying them. 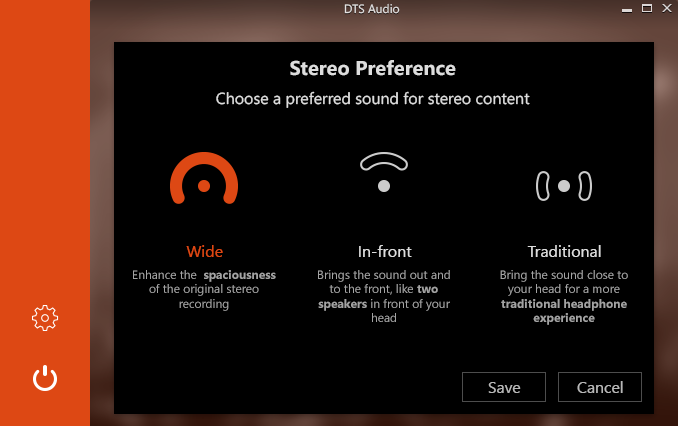 For headphones, the user could choose one of several stereo virtualization options. Objectively, certain kinds of music sound better with the Wide setting, while other kinds sound better with In-front selected. In user testing, we've found a close split between the two preferences, in general. 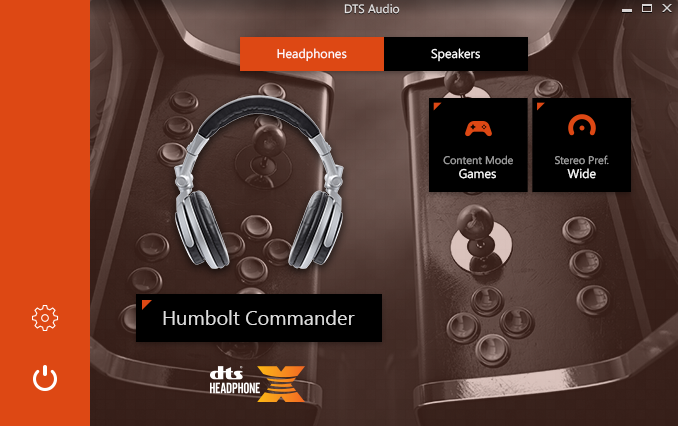 For headphones, the DTS Headphone:X audio engine can be configured with reverb and spatial values to provide pretty amazing immersive audio experiences for multi-channel (2.1 and higher) content. 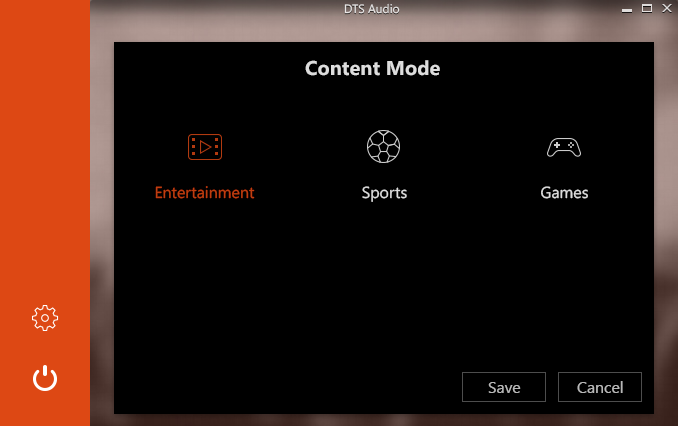 The Content Mode Screen helps the user choose among the available modes. 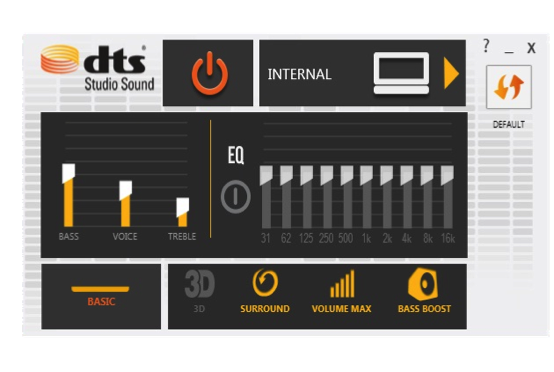 I used this project as the touchstone for standardizing the About Screen contents across all DTS audio products, including both consumer-facing and professional studio tools. I worked closely with the Marketing and Legal departments on the text, layout, and notices. 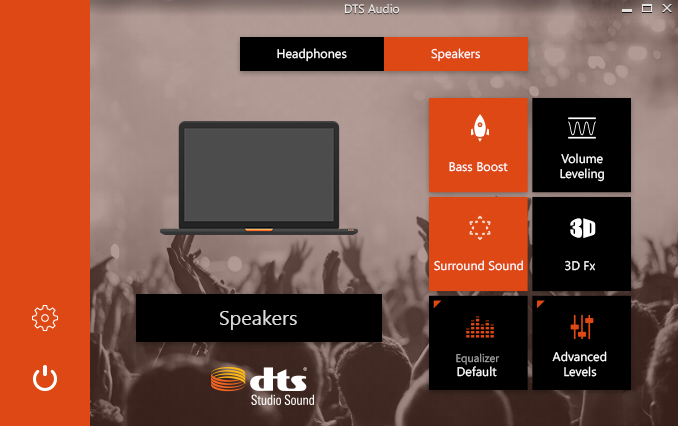 The user is free to turn off all DTS enhancements on the PC for both headphones and the built-in speakers. Rather than just showing all of the UI controls in a disabled state, I wanted to show something more interesting. I worked with Marketing to craft a message explaining the benefits of the technology in a relatable and easy to understand way.